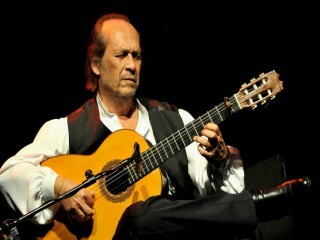 Paco de Lucía, born Francisco Sánchez Gómez , is a Spanish virtuoso flamenco guitarist and composer. He is considered by many to be one of the finest guitarists in the world and the greatest guitarist of the flamenco genre. He is noted in particular for his dexterity, technique and strength in his right hand, capable of executing extremely fast passages using just the tips of his fingers. Bill Milkowski described the great flamenco guitarist, Paco de Lucia, as "The portrait of studied concentration and pristine perfection: stiff backed and stern faced, with a distinguished air about him that some might misread as haughtiness," in Down Beat. "He's proud and majestic, like a regal Arabian steed prancing with grace and elegance, yet able to reveal great power." He first took up the guitar at age seven and began receiving lessons from his father, Antonio de Algeciras (stage name) and his brother, Ramon. "I was playing for more than ten years when Paco first began to play the guitar," the elder brother stated in Guitar Player. "I taught him, although I wasn't his only influence by any means. Paco had a great deal of talent from the very beginning." De Lucia studied the toques of his idol, Nino Ricardo, almost exclusively until he was twelve years old. After winning a local competition a year later, he was asked by Jose Greco to join the dancer's company and travel to America to play. It was here that one of the flamenco masters, Sabicas, was so impressed by the youth's talent that he urged him to devote his time to developing a style of his own. At age fourteen he was deemed too young to play for the main prize in the La Catedra de Flamencologia in Jerez, but his performance was so stunning that he was awarded a special prize: El Premio Internacional de Acompanamiento. He would enter the recording studio just a year later. De Lucia also began to tour with Ramon under the Algeciras name, backing up singers and dancers as he had during most of his life. It was his teaming with Gypsy singer Camaron de la Isla and their mixture of contemporary and traditional styles that would mark the beginning of his controversial and successful career. Having already mastered the technical aspects of flamenco music, de Lucia began incorporating chords and scales that were usually associated with jazz. "The feeling is very much the same in both flamenco and jazz," he explained in Down Beat. The difference is that flamenco "is really much more anarchic." In 1976 de Lucia recorded a rumba, "Entre Dos Aguas", which had never been done before in flamenco history. High sales figures for the single, which made the Spanish Top 20, immediately established him as an international superstar. Flamenco purists were outraged and considered the single a bastardization of their music. De Lucia defended his concept though, stating that he would remain true to the traditional form but that there must also be room for change. "I was brought up in a flamenco atmosphere, and I only really feel flamenco, and after that I play what I want to play without worry," he said in Guitar. He continued to explore new territories in 1977 by recording on American fusion guitarist Al DiMeola's album, Elegant Gypsy. Traditionalists were even more upset upon hearing the mostly electric album, but DiMeola defended the Spaniard in Down Beat, stating, "He's not leaving flamenco, he's expanding it." For such an emotional player as de Lucia (he does not even read music), who has admitted influences as experimental as Jimi Hendrix, it must have been very hard to try and grow and yet remain faithful to his past. "I cannot do with flamenco all that I should like because then it loses its identity," he told Down Beat. Regardless of what his mentors were saying, de Lucia was forging a new style that was more than welcome by his audiences. From 1977 to 1981 he won the Guitar Player Readers' Poll Award for Best Flamenco Guitarist and became a member of the magazine's Gallery of Greats. Although he continued recording, his rise to the top and continuous creativity would take a toll. "I have had so many periods of anxiety and nervousness since becoming more popular, and fame can eat you, " he told Guitar Player. "You always have so much pressure to repeat your successes." But de Lucia was able to create magic once again in 1980 with the help of DiMeola and John McLaughlin. The three formed an acoustic-guitar super trio that stunned audiences with their brilliant musicianship. Evidence of their virtuosity and comraderie can be heard on the live 1981 album, Friday Night in San Francisco. McLaughlin explained the group's conception to Guitar Player's Tom Wheeler: "Al and I had the same idea--to play with Paco. I heard Paco on the radio, and it was love at first hearing. I said, 'I have to play with this man, and that's all I know.' And so I looked for him until I found him." Two years later the trio would enter the studio to record an appropriately titled follow-up LP, Passion, Grace and Fire. De Lucia is still playing the flamenco music that is so much a part of the rich Gypsy heritage, but in a way that is both rooted in the past and easily accessible to today's audiences. Those who may doubt his commitment to either should take note. "... I play guitar not for me, but for flamenco," de Lucia told Guitar Player. "I don't want to be a star, or a rich man. I am working for my village, for my country, for my music, for the tradition of the art form, and I want to make the music better." In 1998, de Lucia released Luzia on the PolyGram subsidiary Blue Thumb label. The release reveals the guitarist's ability to blur the lines between traditional aspects of flamenco, jazz and classical music. "The flamenco guitarist spends a lot of time learning to be expressive with the right hand--as opposed to classical guitarists who work on the left hand," de Lucia told Guitar Player writer Adam Levy. "Flamenco music has always been harmonically primitive, so the players put all their energy into the right hand, to play rhythmically with a tight, intense, and emotional feeling. That makes the flamenco player's right hand faster and more sophisticated than any other type of guitar player." The pyrotechnics often exhibited by guitar heroes of any genre upset de Lucia, who told Levy: "Technique should be something that you don't see.... I hate it when I see somebody doing something very difficult, and the difficulty is visible. Technique is to have, then to forget." In 1999, a video of the 1979 Royal Albert Hall concert by de Lucia, John McLaughlin and Larry Coryell was released, entitled Meeting of the Spirits. If critics were ecstatic when writing of the original concert, they were equally effusive about the video document of the event. In 2004, de Lucia released Consitas Buenos, on which he plays other such stringed instruments as the lute, bouzouki, tres, and mandolin. Guitar Player writer Barry Cleveland described the release as music that "dances and soars into unexpected harmonic and melodic realms, while remaining firmly grounded in traditional rhythms, and, on all but two pieces, the guitars share the spotlight with one or more celebrated singers (including the late Cameron de la Isla, whose legendary voice was miraculously resurrected via digital technology on 'Que Venga el Alba')." The University of Cadiz recognized de Lucía's musical and cultural contributions by conferring on him the title of Doctor Honoris Causa on March 23, 2007. -La Guitarra Fabulosa de Paco de Lucia Verve, 1984. -Live...One Summer Night Polydor, 1984. -Entre Dos Aguas Polydor, 1986. -Solo Quiero Caminar Polydor, 1986. -Fuente y Caudal Alex, 1991. -Recital de Guitarra Alex, 1991. -Manuel De Falla Alex, 1992. -12 Canciones de Garcia Lorca Alex, 1992. -Concerto de Aranjuez Verve, 1993. -Live in America Philips, 1994. -Dos Guitarras Flamencas En America Latina Polygram, 1994. -El Duende Flamenco de Paco de Lucia Polygram, 1994. -Intrepreta A Manuel De Falla Philips, 1995. -Guitar Trio: Paco de Lucia, John McLaughlin, Al Di Meola Verve, 1996. -Alcazar de Sevilla Records, 1998. -Espana en Una Guitarra Orfeon, 2000. -Guitare and Song Magnum, 2002. -Cositos Buenos Blue Thumb, 2004. -(With Ricardo Modrego) 12 Canciones de Garcia Lorca para Dos Guitarras en Stereo Philips. -(With Ricardo Modrego) 12 Exitos para Dos Guitarras Flamencas Philips. -(With Ricardo Modrego) Dos Guitarras Flamencas Philips. -(With Al DiMeola) Elegant Gypsy Columbia, 1977. -(With John McLaughlin and Larry Coryell) Castro Marin Philips. -(With Paco Pena) Paco Doble Philips. -(With Al DiMeola and John McLaughlin) Friday Night in San Francisco Columbia, 1981. -(With Al DiMeola and John McLaughlin) Passion, Grace and Fire Columbia, 1983. -(With Ramon de Algeciras) Dos Guitarras Flamencas en America Latina Philips, 1994. -(With Ramon de Algeciras) Paco de Lucia y Ramon de Algeciras en Latino America Philips, 1996.